Where Do Recyclable Materials Go? 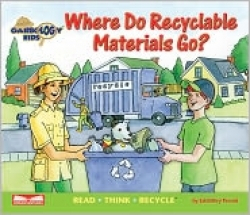 The first in an intended series entitled Garbology Kids™, Where Do Recyclable Materials Go? takes the next step in educating children about the importance of recycling by explaining what actually happens after you put an item in the recycling bin. An educational resource for parents and teachers alike, the book will educate and entertain while also encouraging children to participate in all aspects of the recycling cycle. The overarching story follows Tiana and her family as they search for their dog Bubbles, who has a habit of chasing after the recycling truck. As they go from home to the vet to the park, and finally to their local Materials Recovery Facility, where they are given a tour, the illustrations feature chat bubbles, diagrams, and text boxes that give additional information about aspects of recycling. With a focus on how materials are collected and sorted, the book gives a behind-the-scenes look at the real process of recycling, and explains how vital it is to our wellbeing. Sabbithry Persad, the founder of Green Solutions magazine, has also included a section after the story with more information about the importance of the entire recycling loop, that is, the “Collecting-Manufacturing-Buying Recycled” process that really is the key to making recycling a worthwhile venture. She also encourages children to learn more through experiments and observation, all of which will emphasize the reality of the situation to children in an empowering way. Because the book seems to be created as an educational tool, the basic storyline as well as the pictures really act as the vehicle for the more informative text, and do not necessarily define the book or stand up well on their own. It is really the informative details of the pictures, not the quality, that make the book interesting and engaging. However, this quality is not to the detriment to the work, and it serves a very clear purpose well. Librarians, educators, and parents will learn a few facts themselves when sharing the book with six to nine year olds. Persad understands that by educating the next generation about the importance of recycling from an early age, we’ll be able to build a society that naturally cares about the earth and knows how to take the steps to protect it and its resources. The valuable insight and information she provides children in this book will be part of a larger dialogue that will contribute to this ongoing education.